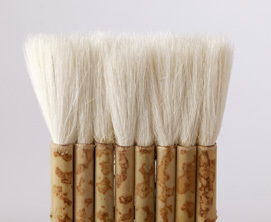 This Hake brush is made of soft sheep hair and is made thick to provide a firm touch. It produces a wide variety of background effects and can be snapped apart to make a smaller brush. The handle is made of bamboo. It is 2 1/2" wide. Can be divided into 8 smaller brushes or used whole.